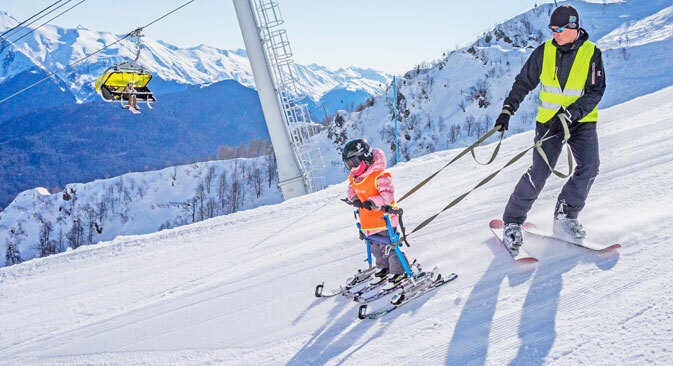 A Sochi instructor is helping children with disabilities to learn to ski on Olympic slopes in the Krasnaya Polyana winter sports resort. Andrey Batalov has taught his five year old daughter - who cannot walk - to ski. Now he hopes to establish Russia's first ever sports rehabilitation center. A year ago, the Olympic slopes at Krasnaya Polyana witnessed fierce competition between the world's leading Paralympic athletes, something unthinkable in Russia - where sporting infrastructure for people with disabilities has only recently begun to emerge. Significant progress in the field is already becoming apparent. 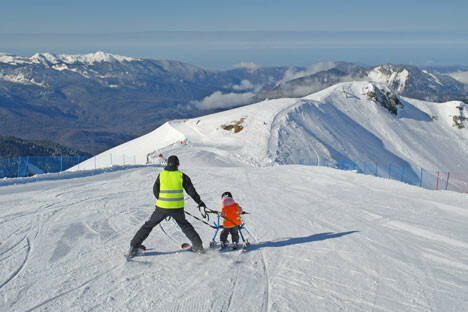 In March 2015, for the first time in Russia, a five-year-old child with cerebral palsy, who is unable to walk, skied – with the aid of a special snow slider – from a height of 2,300 meters to 1,170 meters, covering a distance of more than five kilometers in the process. The little athlete's father Andrey Batalov has worked as a skiing instructor in Sochi for many years. When Tanya was just a toddler, Andrey often took her with him to the slopes: "I was skiing with my daughter behind my back, sitting in a special backpack. She loved it and I dreamed that one day I would teach her to ski. Back then it seemed a pipe dream." Andrey is one of the few parents in Russia whose child's disability has prompted them to resort to some desperate measures, like taking charge of their children's rehabilitation. In just a year he managed to achieve something almost impossible: his five-year-old daughter, who is unable to walk, is now an enthusiastic skier. There is a special program called "Dream Skis" that has been operating in Russia for several years already. It runs a network of adapted slopes where children with serious disabilities are taught to ski. "I came across this program by chance in the spring of 2014 when I was browsing the Internet," says Andrey. "As soon as I heard of the training course for Dream Skis instructors, I packed my things and set off for Moscow. My aim was to get this training and to start teaching my daughter. I borrowed money from friends in order to buy a snow slider from the Moscow program for Sochi. When I came back, I began to promote this project all by myself," he recalls. When he approached them with the idea of teaching disabled children to ski, all the ski resorts in Sochi with the exception of Rosa Khutor, near Krasnaya Polyana, turned down Andrey. At Rosa Khutor not everything was easy. "We called it an experiment with my child and all the responsibility was on me as her parent." Once the new program had been tested on Tanya, five more children were enrolled into a group and undertook three days of training. Eventually, resort managers approved a proposal to extend the experimental program to a whole season. More than 20 children, aged from four to 11, from different parts of Russia, have now tested the new method on the Sochi slopes. "Our program works for people with various diagnoses, from cerebral palsy to Down's syndrome to autism as well as wheelchair-bound patients, " says Andrey. "We tried to reduce the cost of this program for parents as much as we could at this experimental stage. The Rosa Khutor resort provides a free ski pass and a training venue as well as special passes for vehicles. Skiing equipment for children has been donated by businesses. All that the parents have to do is to come to the resort, rent accommodation and pay for sessions with the instructor." Andrey and his supporters have big plans: to introduce new activities like ski bike, climbing, ski rollers and even rafting and to set up an all-year-round center in Krasnaya Polyana for adaptive sport and physical education for people with disabilities. He hopes this currently unique idea for Russia will attract the attention of partners and funds and that very soon the first rehabilitation activities center in Sochi will be launched. Elena, mother of Alina, 4: "We'll be coming back for more training as part of this program. Alina is now able to stand better and can make several steps unaided. She has become better at expressing her thoughts and at focusing her attention. And all this was achieved after just 10 sessions." Fatima: "The determination and patience that Rusik has shown during the training sessions is itself invaluable. I can see how he is holding his head better; his back has become stronger. This type of rehabilitation is essential for us. Normally it is very hard to make the muscles in the back and the neck work for an hour. Here there is no other option. He has to hold up his head; it is interesting and fun. Skiing down the slope is so exciting." Nadezhda: "For Anton, putting on the boots and especially the helmet was a real ordeal: he cried every time he went out on the slopes. Autistic children often take a long time to get used to anything new. Well, yesterday he ran to the ski rental, that's how keen he was to ski. There was not a more pleased skier on the slope. They did three runs. Anton, when instructed, turned right and left and bent his knees, all by himself."